Background Sessile serrated polyps (SSPs) are important precursors of colorectal carcinoma and interval cancer. 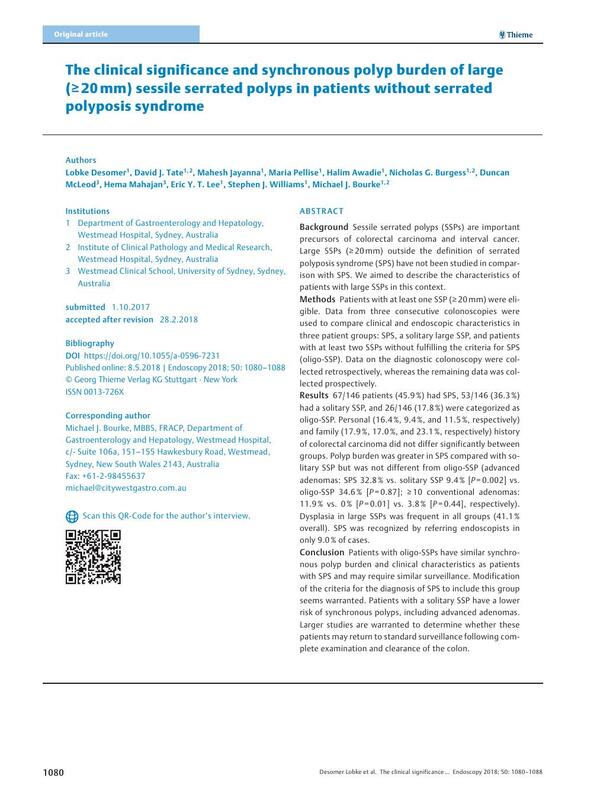 Large SSPs (≥ 20 mm) outside the definition of serrated polyposis syndrome (SPS) have not been studied in comparison with SPS. We aimed to describe the characteristics of patients with large SSPs in this context. Methods Patients with at least one SSP (≥ 20 mm) were eligible. Data from three consecutive colonoscopies were used to compare clinical and endoscopic characteristics in three patient groups: SPS, a solitary large SSP, and patients with at least two SSPs without fulfilling the criteria for SPS (oligo-SSP). Data on the diagnostic colonoscopy were collected retrospectively, whereas the remaining data was collected prospectively. Results 67/146 patients (45.9 %) had SPS, 53/146 (36.3 %) had a solitary SSP, and 26/146 (17.8 %) were categorized as oligo-SSP. Personal (16.4 %, 9.4 %, and 11.5 %, respectively) and family (17.9 %, 17.0 %, and 23.1 %, respectively) history of colorectal carcinoma did not differ significantly between groups. Polyp burden was greater in SPS compared with solitary SSP but was not different from oligo-SSP (advanced adenomas: SPS 32.8 % vs. solitary SSP 9.4 % [P = 0.002] vs. oligo-SSP 34.6 % [P = 0.87]; ≥ 10 conventional adenomas: 11.9 % vs. 0 % [P = 0.01] vs. 3.8 % [P = 0.44], respectively). Dysplasia in large SSPs was frequent in all groups (41.1 % overall). SPS was recognized by referring endoscopists in only 9.0 % of cases. Conclusion Patients with oligo-SSPs have similar synchronous polyp burden and clinical characteristics as patients with SPS and may require similar surveillance. Modification of the criteria for the diagnosis of SPS to include this group seems warranted. Patients with a solitary SSP have a lower risk of synchronous polyps, including advanced adenomas. Larger studies are warranted to determine whether these patients may return to standard surveillance following complete examination and clearance of the colon.